Intech® believes it can add value for its clients by capturing natural stock-price volatility to generate an excess return above the benchmark, over time. Implementing a scientific and disciplined risk-managed investment process, we do not forecast stock alphas; instead we attempt to construct a more-efficient portfolio by estimating the correlations and volatilities of stocks. Periodically rebalancing the portfolio back to optimal target weights, as stock prices move up and down, provides the potential to add return by beneficially capturing the natural volatility of stocks. It is this rebalancing, which can be applied to any equity benchmark our clients seek to outperform, that is necessary for preserving diversification and potentially achieving higher portfolio compound returns. 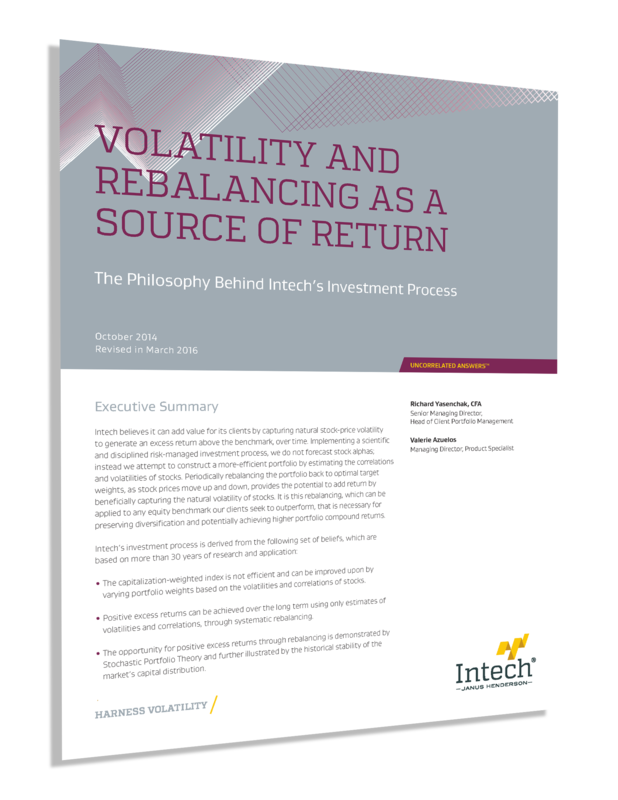 In our paper, “Volatility and Rebalancing as a Source of Return,” we discuss the Intech® investment process – derived from beliefs based on more than 30 years of research and application – and how this process can capture stock-price volatility and potentially outperform the market or a benchmark, over time.